1, apex of twig with male flowers; 2, apex of twig with female flowers; 3, fruiting twig. Protologue: Bull. Misc. Inform. Kew 1908: 439 (1908). 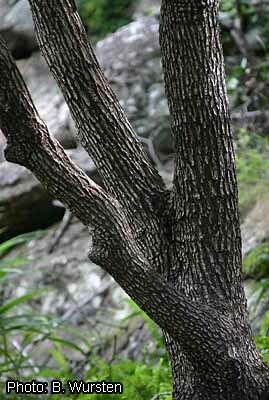 Lebombo ironwood, wild quince, simbi tree (En). Androstachys johnsonii occurs in Zimbabwe, Mozambique, north-eastern South Africa, Swaziland and Madagascar. The wood, known as ‘Lebombo ironwood’ or ‘mecrusse’ in south-eastern mainland Africa and as ‘merana’ in Madagascar, is in demand for poles in house and bridge building because of its durability, and also for flooring, stairs, laths, fences, mine props and railway sleepers. It is valued for furniture for both indoor and outdoor uses, and for sculptures and turnery. It is suitable for vehicle bodies, sporting goods, toys, novelties, agricultural implements, musical instruments, precision equipment, carvings, pattern making and draining boards. The wood is also used as firewood and for charcoal production. Livestock browses on the leaves. The wood of Androstachys johnsonii is rarely traded, probably because of limited supply, and is mainly used locally. However, in 2005 it was one of the most exploited timber species in Mozambique. The heartwood is pale brown to golden yellowish brown or pale reddish brown, with darker markings, and indistinctly demarcated from the whitish yellow, 1–1.5 cm thick sapwood. The grain is usually straight, occasionally wavy, texture fine and even. The wood is greasy to the touch. The wood is heavy, with a density of 810–960 kg/m³ at 12% moisture content. It air dries slowly and is susceptible to checking; air drying should be done carefully, using thin stickers and under cover. The rates of shrinkage are moderate, from green to oven dry 5.8–6.0% radial and 6.2–6.6% tangential. Once dry, the wood is not stable in service. At 12% moisture content, the modulus of rupture is 92–162 N/mm², modulus of elasticity 9900–12,150 N/mm², compression parallel to grain 57–66 N/mm², cleavage 18.5 N/mm, Janka side hardness 11,270–12,580 N and Janka end hardness 18,230 N.
The wood is fairly easy to saw and work in spite of its hardness. It finishes well, showing a nice polish. It holds nails and screws well, but pre-boring is needed. It is easy to glue and is considered excellent for turnery. It is very durable. In South Africa poles used for huts showed no sign of deterioration after 40 years. The wood is resistant to fungal, termite, Lyctus and marine borer attacks. It is resistant to impregnation with preservatives. The flowers provide nectar for honey bees, but it has been recorded that the honey is poisonous and has a purgative action. Several diterpenoid constituents have been isolated from the heartwood. Evergreen to deciduous, dioecious, small to medium-sized tree up to 25(–35) m tall; bole branchless for up to 15 m, usually straight and cylindrical, up to 100 cm in diameter; bark surface longitudinally fissured, blackish grey; twigs angular, jointed, densely whitish to greyish woolly hairy. Leaves decussately opposite, simple and entire; stipules initially fused into a sheath up to 3.5 cm long, later becoming separate and caducous; petiole 0.5–4 cm long; blade broadly ovate to nearly cordate, 3–9(–13) cm × 2–7(–12) cm, cuneate to rounded or truncate at base, obtuse to rounded at apex, leathery, glabrous above, densely whitish short-hairy below, 5–7-veined from the base and with 5–8 pairs of lateral veins. Flowers axillary, unisexual, yellowish, pedicel 0.5–1.5 cm long, sepals long-hairy outside, petals absent; male flowers 3 together, with 2–5 sepals c. 4 mm long and up to 50 stamens c. 1 mm long on an elongate receptacle up to 2 cm long; female flowers solitary, with 5–6 sepals c. 8 mm long and a superior, ovoid, densely hairy ovary c. 3 mm long, style c. 7 mm long, 3-branched. Fruit a 3-lobed capsule 8–10 mm × 12–13 mm, minutely hairy, yellowish to pale brown when mature, dehiscing with 6 valves, 6-seeded. Seeds ovoid, laterally flattened, c. 7 mm × 5 mm, shallowly ridged, glossy brown. Apart from Androstachys johnsonii, 4 other species have been described in Androstachys, all from Madagascar. These differ in having digitately compound leaves, stipular sheaths fused to the petioles, more hairy anthers and pointed fruits, and have been referred to a separate genus Stachyandra, although this is questionably distinct. The wood of these species is reportedly also hard and durable, and occasionally used in construction. Vessels: 5: wood diffuse-porous; (9: vessels exclusively solitary (90% or more)); 13: simple perforation plates; 22: intervessel pits alternate; 25: intervessel pits small (4–7 μm); 30: vessel-ray pits with distinct borders; similar to intervessel pits in size and shape throughout the ray cell; 41: mean tangential diameter of vessel lumina 50–100 μm; 49: 40–100 vessels per square millimetre; 50: ≥ 100 vessels per square milllimetre; 58: gums and other deposits in heartwood vessels. Tracheids and fibres: 62: fibres with distinctly bordered pits; 63: fibre pits common in both radial and tangential walls; 66: non-septate fibres present; 70: fibres very thick-walled. Axial parenchyma: (75: axial parenchyma absent or extremely rare); (76: axial parenchyma diffuse); 78: axial parenchyma scanty paratracheal. Rays: 96: rays exclusively uniseriate; 104: all ray cells procumbent; 115: 4–12 rays per mm. Mineral inclusions: 136: prismatic crystals present; 142: prismatic crystals in chambered axial parenchyma cells; 143: prismatic crystals in fibres. Androstachys johnstonii grows very slowly. It shows monopodial growth. Trees lose their leaves irregularly. In south-eastern mainland Africa, trees flower in October–November and ripe fruits can be found in November to March. The flowers are wind-pollinated. The fruits are eaten by small antelopes, squirrels and birds, and these animals may disperse the seeds. Androstachys johnsonii occurs gregariously in deciduous woodland, often on rocky hillsides and stony outcrops, also along seasonal rivers but on well-drained soils, up to 1000 m altitude. In Swaziland it is locally dominant in dry forest where some cloud cover prevails. Young plants are not frost tolerant. Seeds germinate readily, and young plants are hardy and can survive in quite dry and warm localities. Trees are often surrounded by numerous seedlings. Large boles may be hollow. They are difficult to cut because of the hard wood. Androstachys johnsonii is locally common and may even form dense thickets. However, in several areas larger trees have been exploited heavily for their wood, and already in 1957 an area of nearly 20,000 ha was designated in Mozambique as reserve (Baixo Pinda Forest Reserve) to protect the coastal forest and enable the recovery of Androstachys johnsonii. However, since then the reserve has been subject to severe forest clearance for agriculture. The Matibane Forest Reserve, also in Mozambique, has an area of about 4200 ha, for a large part covered by Androstachys johnsonii. It seems unlikely that Androstachys johnsonii will increase in importance on the timber market because it has a limited area of distribution and grows very slowly. However, as long as stands of sufficient extent exist, it will locally remain of importance for heavy and durable construction. Monitoring of populations is recommended. Airy Shaw, H.K., 1970. The genus Androstachys Prain in Madagascar. Adansonia, sér. 2, 10(4): 519–524. Ali, A.C., Uetimane Jr, E., Lhate, I.A. & Terziev, N., 2008. Anatomical characteristics, properties and use of traditionally used and lesser-known wood species from Mozambique: a literature review. Wood Science and Technology 42(6): 453–472. Capuron, R., 1957. Essai d’introduction à l’étude de la flore forestière de Madagascar. Inspection Générale des Eaux et Forêts, Antananarivo, Madagascar. 125 pp. Leandri, J., 1958. Euphorbiacées (Euphorbiaceae). Flore de Madagascar et des Comores (plantes vasculaires), famille 111. Firmin-Didot et cie., Paris, France. 209 pp. Alvin, K.L. & Rao, T.A., 1987. On the unusual distribution of leaf sclereids in Androstachys johnsonii Prain (Euphorbiaceae). Botanical Journal of the Linnean Society 95(1): 55–60. Bandeira, S.O., Albano, G. & Barbosa, F.M., 1999. Diversity and uses of plant species in Goba, Lebombo mountains, Mozambique, with emphasis on trees and shrubs In: Timberlake, J. & Kativu, S. (Editors). African Plants: biodiversity, taxonomy and uses, Royal Botanic Gardens, Kew, United Kingdom. pp. 429–439. CTFT (Centre Technique Forestier Tropical), 1964. Mercusse, Androstachys johnsonii Prain (Euphorbiacées). Information technique No 202, Centre Technique Forestier Tropical, Nogent sur-Marne, France. 2 pp. Radcliffe-Smith, A., 1991. Notes on Madagascan Euphorbiaceae III: Stachyandra. Kew Bulletin 45(3): 561–568. Tanzania Forest Conservation Group, 2007. Coastal forests of Kenya and Tanzania. Mozambique. [Internet] http://coastalforests.tfcg.org/mozambique.html. November 2010. Lemmens, R.H.M.J., 2011. Androstachys johnsonii Prain. In: Lemmens, R.H.M.J., Louppe, D. & Oteng-Amoako, A.A. (Editors). PROTA (Plant Resources of Tropical Africa / Ressources végétales de l’Afrique tropicale), Wageningen, Netherlands. Accessed 11 April 2019.